Ireland’s Laurence McGivern and James Scully have reached tonight’s finals of the S9 100m Backstroke and S5 50m Freestyle respectively at the Paralympic Swimming European Championships in Eindhoven. McGivern was first up for the Irish in the heats of the 100m Backstroke S9. 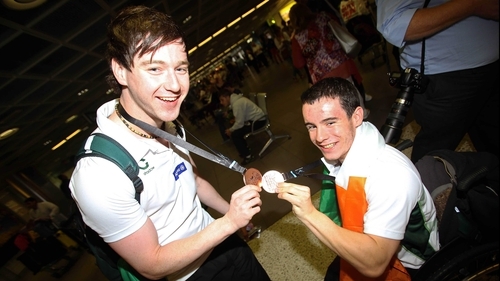 The 21- year-old from Rostrevor, County Down was seeded as second fastest in the event in a time of 1:04.75, which he swam at the Paralympic Swimming World Championships in Canada last summer to claim a bronze medal. And the Invictus Belfast club swimmer won this morning’s heat in a time of 1:06.60 to qualify for this evening’s final (4.03pm Irish time). Following his bronze medal win in the 200m Freestyle S5 last night, Ratoath’s James Scully will contest his third final of the week tonight in the 50m Freestyle S5. Scully touched in fifth in this morning’s heats in 38.43, just off his best time of 37.60. Sebastian Rodriguez was the fastest qualifier in the event in 35.36 seconds. Ailbhe Kelly and Ellen Keane were also in action this morning in the finals of the 100m Freestyle S8 and 100m Backstroke S9 respectively. Newcomer Kelly was just outside her best in the Freestyle hitting the wall in seventh place in 1:23.86. The 15-year-old from Castleknock in Dublin has made an impressive debut at these Championships and has one more event to come tomorrow when she starts in the final of the S8 50m Freestyle at 4.24pm Irish time. Double Paralympian Keane was also close to her best in the Backstroke final, clocking 1:20.59 and claiming fifth place overall. The Dubliner also has one race left at these Championships tomorrow morning; the S9 100m Butterfly in which she won a bronze medal at last year’s World Championships in Montreal.